Need to get covered for a shift? 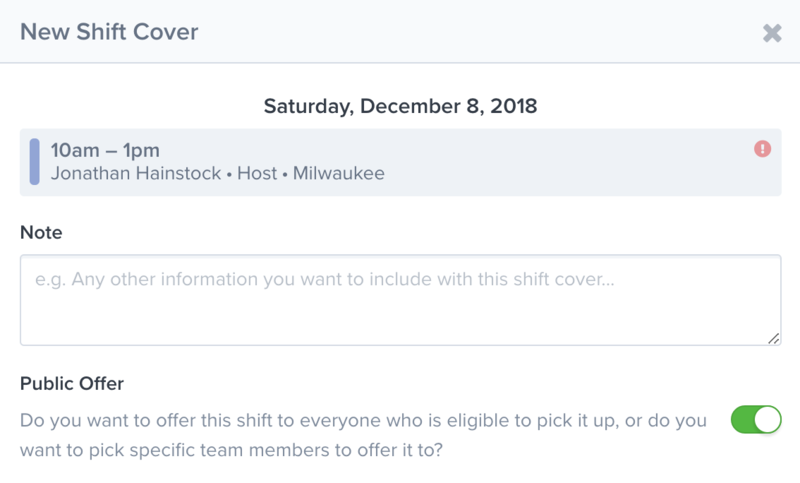 No problem, you can request a shift cover from your team. A supervisor approves your request. Team members are notified of the available shift. A co-worker picks up your shift. To create a shift cover request, click on the shift you want to offer up. You should see a pop-up like the one below. You can add a note, giving your supervisor more information about your request. You can also select the people you would like to offer your shift to. Update the fields, and submit the form. Once submitted, your supervisor will be notified and can approve or deny your request. Note: Until your request is approved, it will be marked as pending. If you click on the shift again you can edit the cover request, delete it, and check the status. Once a manager approves or denies your request, you will receive a notification. Once someone picks up your shift, you will receive a notification letting you know your cover has been completed.